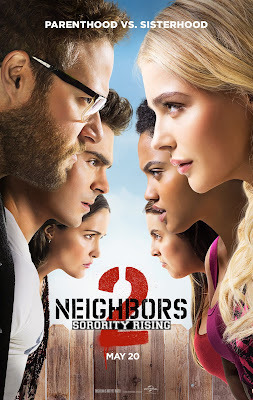 If nothing else, Neighbors 2: Sorority Rising deserves points for having noble intentions. 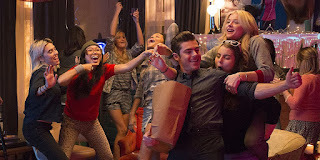 Whereas 2014’s Neighbors used its riotous Yuppies vs Frat Brats premise to explore the dividing line between the recklessness of youth and grown-up responsibility, this second installment has its sights squarely set on the entrenched misogyny of college party culture and the necessity for gender equality. Very timely subject matter, to be sure, and there’s an admirable amount of anger and witty insight contained within the picture’s rat-a-tat joke structure. Alas, despite having its heart firmly in the right place, this second go-round’s laugh ratio is notably reduced from its predecessor, and the freshness has mostly leaked out. Pardon me if I’m repeating myself, but comedy depends on surprise to succeed. Familiarity is the enemy, as the goal is to constantly catch the audience off guard. This is why so many sequels deliver weary diminished returns. For every A Shot in the Dark, Clerks 2 or 22 Jump Street, which expand and push the property into weird and unexpected places, there are a dozen lame recycle jobs like The Hangover Part II, Horrible Bosses 2 or – God forbid all that is good and holy in the universe – Caddyshack II. Ultimately, Sorority Rising lands somewhere in the safe, albeit unremarkable, middle ground; it at least offers some funny new gags and ideas. The film also benefits from having great established character dynamics to fall back on. 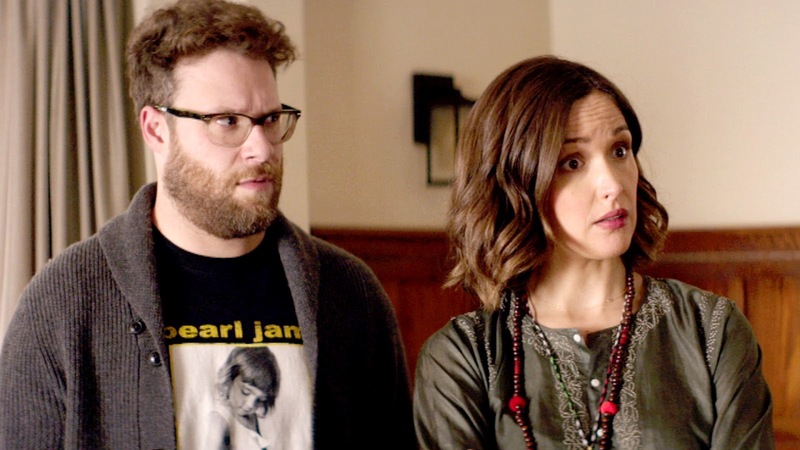 Seth Rogen and Rose Byrne continue to be an infectiously amusing on-screen couple, and they have big time chemistry with Zac Efron’s dim and directionless aging hellraiser. Throw in some shot-in-the-arm supporting parts for favorites Dave Franco, Ike Barinholtz and Carla Gallo and you’re at least guaranteed a pleasant enough time. Is that really enough to warrant the revisit, though? When we’re reacquainted with Mac and Kelly Radner (Rogen and Byrne), they’re proud, if unrefined, parents on the verge of selling their infamous home. However, as the residence sits in escrow purgatory and the prospective buyers begin assessments, disgruntled college student Shelby (Chloë Grace Moretz) flees the outdated and “rapey” atmosphere of her campus’s frat and sorority scene in order to establish her own female-friendly party house next door. Operating under the dubious mentorship of Efron’s developmentally arrested Teddy Sanders, the girls fast hurl the Radner’s quiet domestic lives into chaos. With their critical real estate transaction on the line, the married pair are forced back to the juvenile front lines once more against an even more resourceful and crafty foe. Perhaps sensing the lingering threat of sequelitis, returning helmer Nicholas Stoller, who shares screenplay duties with four (!) other writers including Rogen, keeps the energy consistent throughout his picture's brief 92-minute runtime, never letting the occasional dud comic beat disrupt momentum. He also stages some impressively creative and effective setpieces, such as a massive tailgate-party-turned-marijuana-heist sequence (complete with shirtless Efron dance number, for those curious) and a repurposed emergency airbag bit, that nail their intended comedic targets and then some. Stoller doesn’t bring the technical panache of, say, Hangover auteur Todd Phillips, but he continues the strong streak of bouncy workmanlike efficiency he brought to memorable past crowd-pleasers Forgetting Sarah Marshall, Get Him to the Greek and, obviously, Neighbors. Where Stoller and his team drop the ball, though, is with the new characters. One of the masterstrokes of the first film was creating an authentic connection between the opposing sides and then splintering it. It was fun to watch Rogen and Byrne battle their urge to rebel and be carefree again, and Efron had a compelling arc that ended on an unexpectedly touching resolution. The talented Moretz and her two sidekicks, Kiersey Clemons and Beanie Feldstein, bring everything they’ve got, yet the movie never fashions an interesting relationship between them and the Radners (imagine if the wonderful Byrne had been inspired by their “Girl Power!” call to arms, for example). Instead they’re narratively tied – through credulity-straining circumstances – to Efron’s Teddy and that somewhat unsettling bond just doesn’t gel. And a subplot thematically linking the rambunctious sorority with Mac and Kelly’s parental anxieties about their daughters feels a script pass or two away from working. Had these three actresses, who fight for their right to party with as much comic might as their male counterparts did, been given equally juicy material Neighbors 2 might have been a more valuable endeavor! 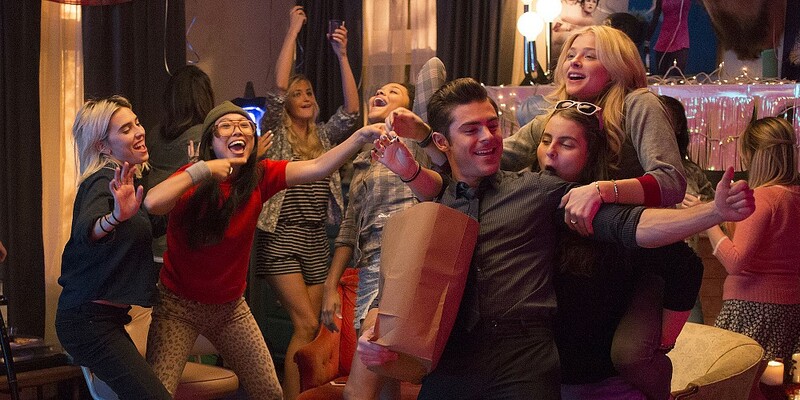 Despite its likeable cast, positive messages and occasional glimmers of originality and wit, it’s tough to recommend making the effort to see Neighbors 2: Sorority Rising on the big screen. Back in the golden age of video stores, this would make for primo rental fodder; humorous and breezy enough to entertain, however not substantial enough to feel passionate about one way or another. It all just makes you wish Stoller and his game team of actors had scrapped the easy sequel route and instead dreamed up a new concept genuinely worth running wild and crazy with.